ShepHertz has recently launched AppWarp S2, an on-premise solution of its popular AppWarp (Real-time Multiplayer Game Server) Cloud offering.AppWarp S2 empowers developers to build MMOs, casual PvPs, casino style card games and much more. It also lets you extend your server side functionality by providing server side APIs through which developers can customize and extend the server side behavior. With this offering, you own the Real-time Multiplayer Game Server which you can deploy on any Infrastructure. For deployment, you need to purchase the VM from any IaaS provider, install all the required software, configure the firewalls and continuously monitor the server to see its up and running. This can be done on your own, however this requires your valuable time and effort. Why to spend so much efforts on the above process for deployment, when one can do this with minimum efforts. App42 PaaS has come up with GPaaS (Gaming Platform as a Service) which lets you concentrate on your code and leave aside all the worries of server side hassles. GPaaS is a specialized PaaS setup for hosting AppWarp S2 Game Server Applications. It works by creating a VM for your Game Server application on App42 PaaS which is pre-configured with all the requirements for running AppWarp S2. Once setup, you can update your AppWarp S2 application code anytime on your GPaaS VM just like you do with any App42 PaaS application i.e. via your GIT repository or by uploading the source code directly from your computer. GPaaS includes AppWarp S2 server side JAVA library. Hence, building and running AppWarp S2 requires the following to be installed on the server machine. AppWarp S2 also comes with a HTML5 dashboard that can be used to monitor your running application. This need not be hosted on the same machine as your game server, as GPaaS VM comes ready with it. GPaaS VMs are instances that come with the above software already installed and setup. To get you started, I will use a AppWarp S2 Chat Server application as an example to show you how to deploy it on App42 PaaS platform. Register with App42 PaaS platform. Install and configure App42 PaaS Client. To setup infrastructure for your GPaaS application, you have to run the ‘app42 setupGPaaS‘ command using the App42 PaaS Client and choose from the relevant options to get your infrastructure ready or you can click on the ‘Create GPaaS Setup’ under ‘Other Solutions’ on the left panel of your App42 PaaS HQ Console and fill in the details to create your GPaaS setup. 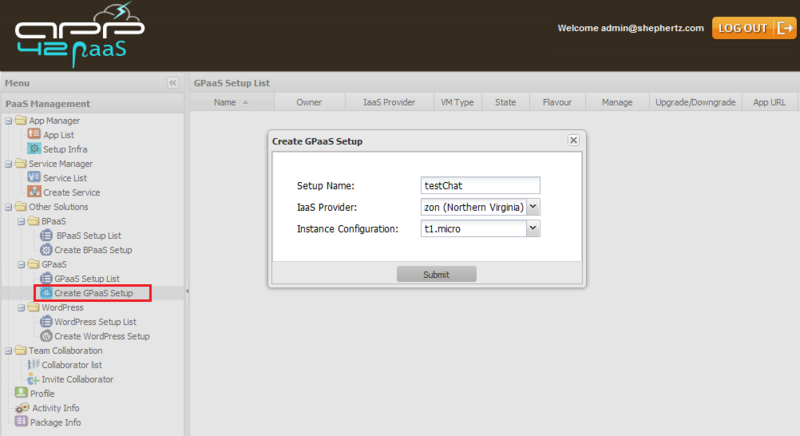 You have successfully setup your GPaaS environment on App42 PaaS platform. Now Click on the ‘GPaaS Setup List’ under ‘Other Solutions’ on the left panel to see the setup list. 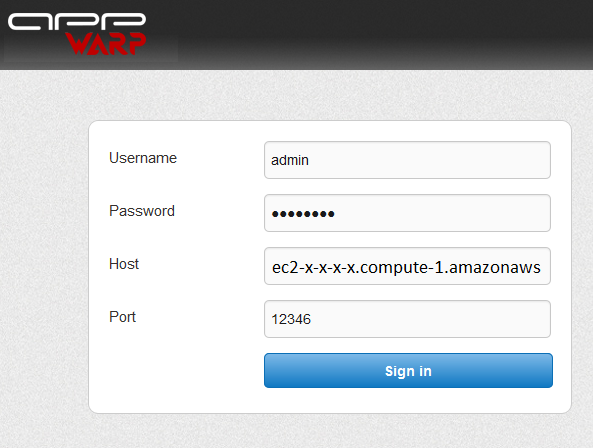 We have already deployed AppWarp S2 Dashboard application on your GPaaS VM. Click on the ‘click’ link under ‘App URL‘ to view your Dashboard application. You can also deploy your Gaming Server application on App42 PaaS either by uploading your code from your computer or we can fetch it from your GIT repo. 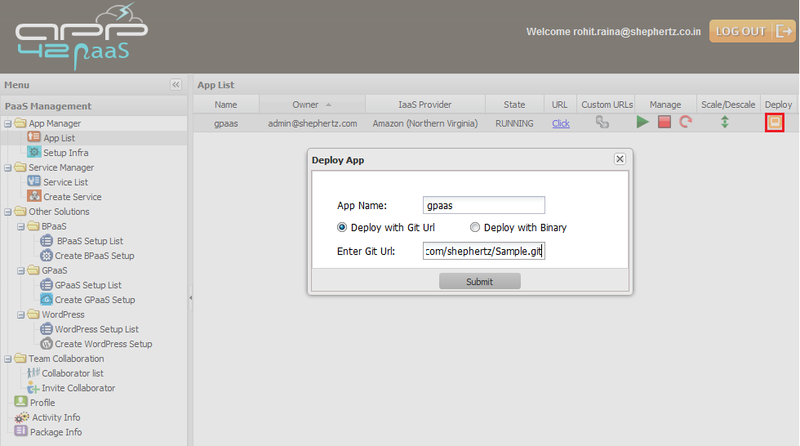 You can deploy your application using your public Git repository URL. All you have to do is to push your code in the master branch. You can also deploy from your private Git repository URL, for that you have to give access to App42PaaS user in your Git project. You can also deploy your application using binary. 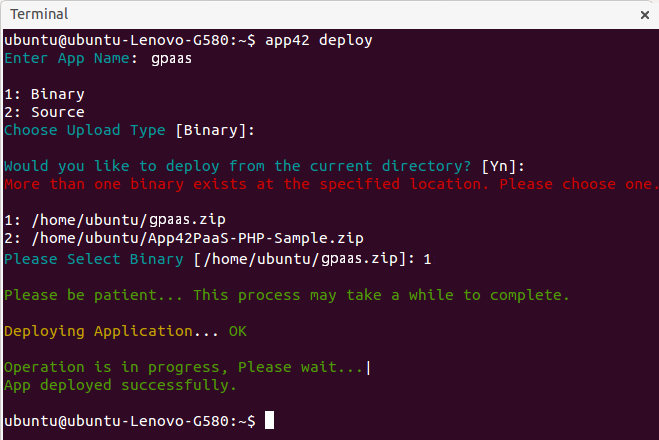 App42 PaaS supports (.zip, .tar.gz, .gz) binary extensions. You can use any of these to deploy your application on App42 PaaS. 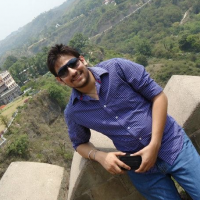 In this blog, I have explained you about GPaaS and how to get started with it. 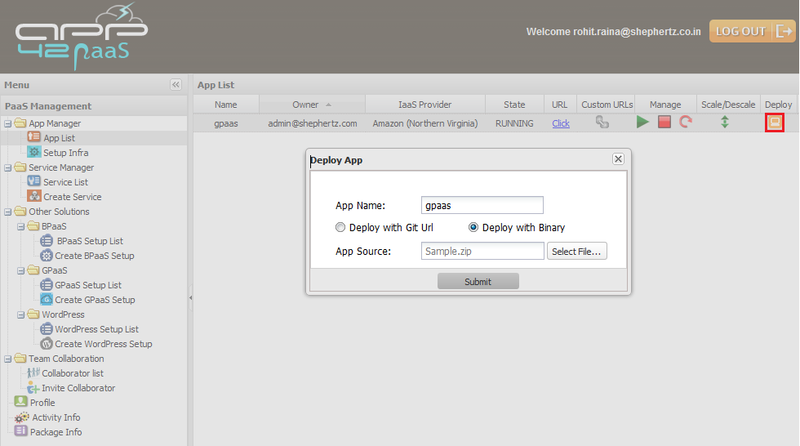 You can extend AppWarp S2 Gaming Server Application and deploy it (as explained above) on GPaaS VM very easily.